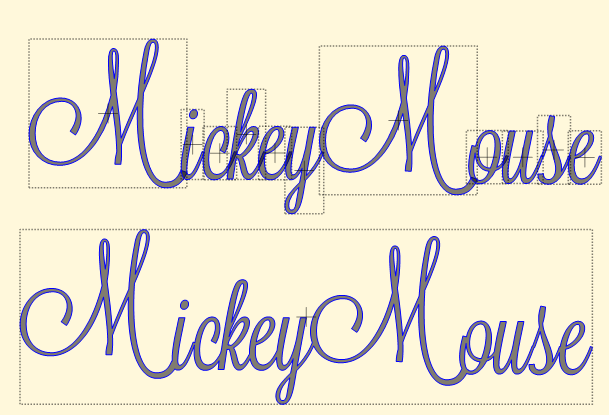 I wrote a title in MTC and added some Mickey ears to it and then welded it. Looks great in MTC, but when I try to export it as an SVG, all of the letters fill in, a, g, l. I've tried several different fonts, and it's the same. What am I doing wrong please? It sounds like the internal parts are separate shapes from the outside, thus when you selected your design to export, you only had the outside shape selected. Try this... select all (Ctrl+A) and then apply a Join and then export again as SVG. If that doesn't fix the issue, please post this MTC file here. 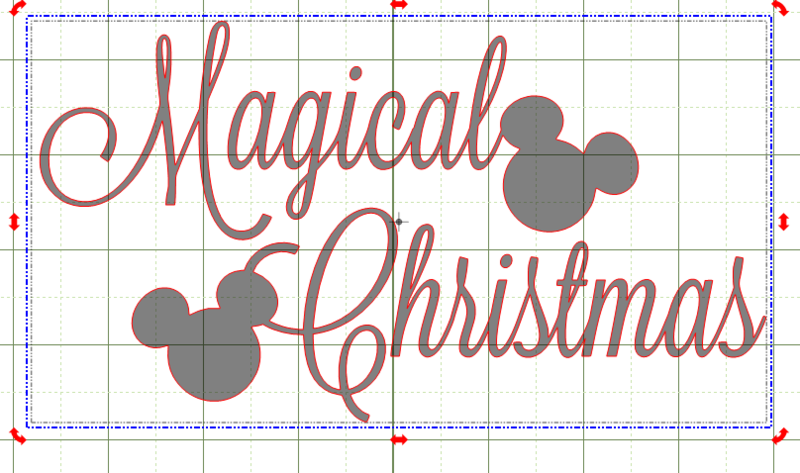 this is the file I'm trying to export to svg, It is Lavenderia font which I kerned a little, added the mickey ears and welding. First, I looked but didn't see what version of Make the Cut are you using? Second, are you using it on a Mac or a PC computer? 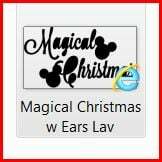 I do not have the Lavenderia font on my computer and I checked for it on Dafont and did not find it. As a result, I had to try with a different font. I had the Lauren Script font so I used it. I am not having the same issue that you are. I entered my text with "Split by Glyphs" selected. Then moved my text as desired and welded the text together. 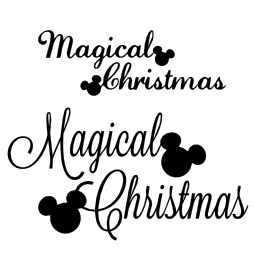 I then added the Mickey heads, placed and rotated them as desired, and welded them to the text. I then selected and exported as an SVG file. I opened the SVG file in Inkscape and MTC and both show correctly with the inner portions of the letters not filled in. 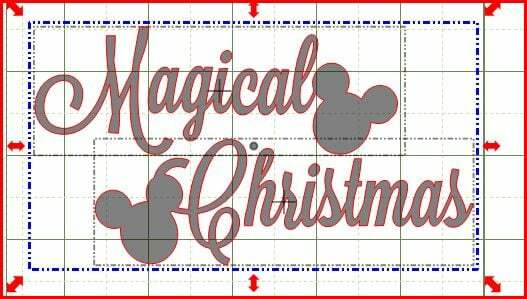 it might be helpful if you tell us step, by step how you create the text and mickey heads and weld. Perhaps we are missing something in what you are doing. If it is not that, then I wonder if it is something with that font. As noted, I don't have it and was unable to test with it. I am including screen captures below. The first one is of the file in MTC. The second one is the SVG opened in Inkscape. Then I included the SVG file its self and the .mtc file. If you are using an older version of MTC, you may not be able to open the MTC file but you should be able to import the SVG file. Okay, tracked down the font Lavenderia from a source I was comfortable getting it from and not worrying too much about it having malware included in the Zip file. I installed it on my PC running MTC version 4.6.1. 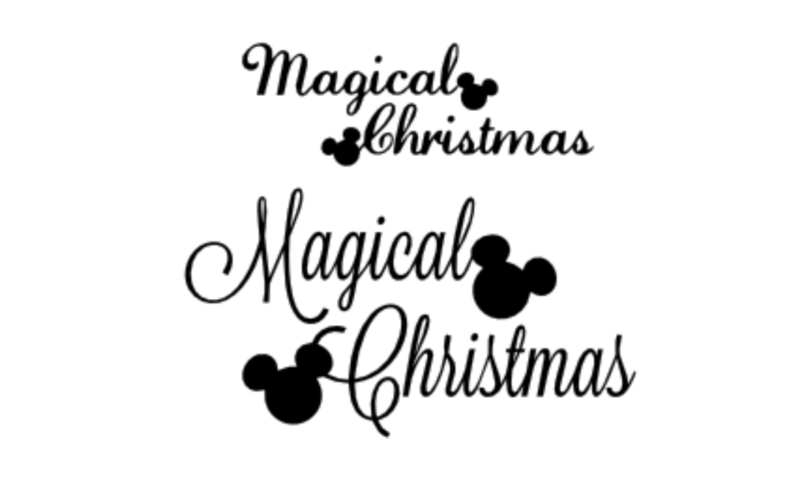 I recreated the Magical Christmas wording by adding with "split by glyphs" selected. I then welded the words. I then added the Mickey heads and placed and then welded those to the words. I then selected and exported out to SVG file. I opened the SVG file again in MTC and in Inkscape both. it appears fine again in both without the insides of the letters missing. I am again adding screen captures and the files I worked with below. The first one is a screen capture from within MTC. The second one shows both of my SVG files with the two different fonts imported into Inkscape, the 3rd is the SVG file using the Lavenderia font and the fourth is the MTC file using the Lavenderia font. So, if you will tell us what version of MTC you are using, and what platform and the actual, step by step YOU are doing we might see if we can determine the issue. You might also include your actual MTC file its self for someone to look at. (Crazy_Mr_Zing showed you above how to try to do that, the other way would be to email it to someone to look at if you cannot attach it here.) Also, did you actually import the SVG file into another program or back into MTC and see what it actually looks like imported? I ask because the screen capture image you show above seems to be the file as it sets on your desktop using Internet Explorer as the "Default" for that file type and I am wondering if it "shows" that way on your desktop, but opens correctly when the SVG file is imported into another program? @TerriM56 - your MTC and file are behaving exactly the way they should, the file called Capture.JPG shows exactly how a closed text shape is supposed to look like. What are you trying to accomplish? What other program are you trying to open the SVG file in? Please add the SVG file here so that someone can look at it and test it in other programs. The way I read TerriM56's messages is that Capture,JPG is how it looks in MTC when she has welded it all together. (The second file in her attachments). The Capture 2.JPG file is what it looks like (at least on her desktop) when she EXPORTS the file to an SVG File which is not how it should look if everything is done correctly and exported out. The only thing that makes sense is what Sandy suggested, that the insides of the letters are still "separate" shapes and not joined as they should be. If she is "breaking" the letters apart at some point, that could explain why her's is not acting correctly on the export EXCEPT she shows that they are not broken and filled in on the MTC file before exporting. (which is the Capture.JPG image.) That's why I think she needs to provide her file(s) for someone to look at and tell us what version of MTC she is using and what platform. is the result the same when you open the file? It appear you have SVGs set to open with Either Microsoft Edge (Internet Explorer) is that what you opening the file with? Totally need to know what program the SVG that was exported from MTC is being opened in. I am using MTC 4.1 on a PC with Vista....I know, behind the times, as I have a Cricut Expression. I haven't gotten to craft much the last 6 years as I babysit grandkids at their house, so I've forgotten a lot, but I love MTC, and want to keep using it. Meflick, I did exactly as you've explained above, and with a few different fonts. It looks great in MTC, but when I export to SVG the letters fill in. I don't have another program to check it in, it's just in my documents folder where it exported. I did just install Inkscape last night, but that's gonna take some time to learn. I was going to send it to a friend who needs svg, so I don't usually need to do this step, and may need to just let it go. Crazy Mr Zing, you asked about opening my svgs in IE. That's how I see any svg I've downloaded. Should I be using something else? And what should I be using? That may be the problem. This Nana is NOT computer savvy. I tried to attach the actual MTC file soooo many times and just can't get it to work, operator error I'm sure. I can't tell you all how much I appreciate all of your help. This group is beyond amazing and thank you all. I can't recall if I still have MTC 4.1 installed on any of my computers or not. I will check and see and if I do, test it on there and see if I can repeat your issue. I don't recall it being an issue in the older versions of MTC, but maybe. It is possible that it is just a "visual" effect perhaps on your file view of the icon. To test that theory, since you have installed Inkscape on your computer, you can open the SVG file you have saved in Inkscape and see if it opens correctly or if the letters are filled in. The other way is to send it on to your friend, and have her import it into her program (what program is she using to import the SVG?) and let her tell you if it opens correctly, or has the letters filled in. You can also open a blank MTC file, and import the SVG file (note its import, not open) and see if it imports correctly. If you find the SVG file that I created using that font above acceptable for use, please feel free to do so and/or pass it on to your friend. If you want to send a pm to me, Crazy_Mr_Zing or any of us - and give us your email address, we can email you and then you can email one of us your .mtc and .svg files to look at. I checked your profile page here and you are not showing an email address listed there for me or anyone to email you directly without you first sending us your email. I tried with different fonts and images welded but I could still not recreate what TerriM56 is saying is occurring for her. Each time I exported the file out to an SVG file, the inner parts of letters were NOT separated and filled in. i also for kicks, even tested it on the MTC 3.2 version and did not have the same issue as TerriM56. Each time, my SVG file exported out of MTC looks fine. So, TerriM56 - Please, give us step by step what you are doing to create your file in MTC and then to export it out. Tell us in the export window, what options you have checked or unchecked as well. Besides that, sending someone your files to look at would be beneficial as well since none of us can recreate your issue, even with the same version you are on. I can not believe how helpful you have all been. It really isn't that important, and I don't want to take up any more of your time. I followed the previous instructions to the letter, so it must just be how it looks in my documents folder. I'll just send the svg that Meflick created, thank you again. I am planning to learn Inkscape which should help if I need to do this again. Thank you all so very much for all of your precious time.